A big decision has been made, and we’ve decided to move to Colorado. This is a HUGE change and adventure for Canadians who have never had a ‘home base’ outside of Canada. Once everything was set up, the biggest challenge was to drive 3,000 km with a Siberian Husky in the car!! We ended up getting a Thule roof box so we could pack things away for the journey, leaving room for the dog crate and overnight luggage in the car. We travel with a crate for two reasons, really: 1) so the dog is not climbing over everything, and 2) most importantly, to keep the husky fur contained! Whenever Loki shakes, moves, breathes, she leaves a pile of hair behind! Especially this time of the year! We scouted out ‘pet-friendly’ hotels along our route and booked rooms each day in advance as some hotels only have a limited number of rooms designated for pets. For me, ‘pet-friendly’ is a hotel that does not charge an additional fee higher than the nightly room charge. A $100 non-refundable deposit a) isn’t really a deposit, and b) exists to discourage travelers with pets from staying there. Another thing we made an effort to do, was scope out dog parks in the towns and cities where we stopped. All hotels we stayed at had free Wi-Fi and we were able to check out the next town in advance and find a place for Loki to run. This allowed us to have uneventful drives the next day while the dog sleeps in the car. The real challenge when travelling with dogs is eating. We search out restaurants with take-out and/or outdoor tables and chairs so that we can eat with Loki. We never leave her alone in the car, and take turns going in to buy groceries/food and use the rest rooms. If it’s raining, we eat in the car. I have to admit, I wasn’t sure what to expect, but Loki has handled the journey like a champ. I think we could definitely travel with her more often and choose vacations that she can take part in. Any hints, tips or best practices for travelling with your pets? 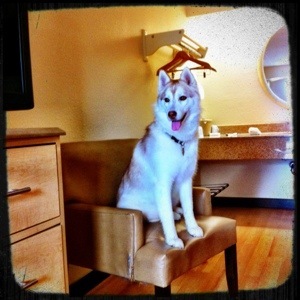 Loki loves the Red Roof Inn. Laminate floors and minimal fabrics. VERY dog friendly! 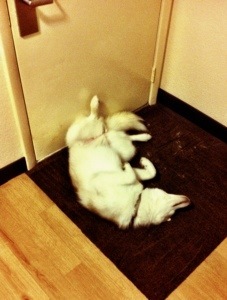 Napping in the hotel, but do it by the door so the boogey man can’t get in! There are fenced in dog parks in many cities and towns across the U.S. and Canada. Scope them out and stop by to stretch some legs! 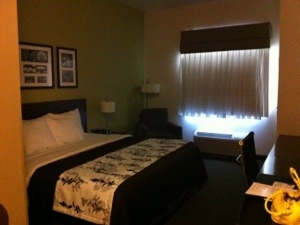 Newly renovated Sleep Inns have great rooms AND pet-friendly! I’m travelling for ten days with my devil pet aka kitty, plus will be in hotels for at least eight more days – this will be a challenge as cats don’t enjoy a nice car ride and romp in the park like their four legged canine minions do. I have a fairly large cat carrier that I use for short trips, but for this adventure I purchased a soft sided folding kennel that has plenty of room for her to move about and find a suitable position to hunt, nap, and look at me in a manner that makes it clear that kitty is not pleased with her servants. The kennel keeps her safe, comfortable and secure, with secure being very important so I don’t have to worry about her taking off faster than a subbie at noon on Friday when I open a door to get out or check on her. Cats do not “come” when you call them, and they don’t poop when you want them to so I put a smallish litter box in the kennel and have a separate on, with lid, for the hotel room. I bought a few rolls of plastic bags to deal with the litter box, and am using the beaded cat litter instead of the clumping clay stuff – it’s well worth the extra cost as it won’t get tracked around the hotel room. I have a little Bissel spot cleaner in case my feline overlord decides that the carpet would look better with a bit of hairball or a nice bit of poop-art. There’s also a spray bottle of pee-begone stuff. Kitty wanted to look her best for the trip so I bought her a pretty overcoat that looks just like a small body harness for a dog – it has the effect of de-activating her and she’s a lot easier to deal with. My very explained that it tricks your cat into thinking momma cat has a grip on her, and you know that you don’t mess with momma! 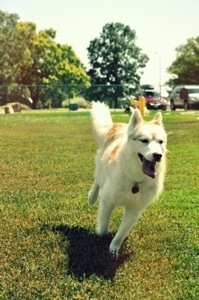 I hope that you and Loki and the hubbs had a good drive and enjoy your new home! Going to a restaurant or especially going on holidays with a dog is always difficult, also in case the dog is as small as our little Min-Pin. I’m always searching on sites like http://www.trivago.com in order to find hotels that allow pets, but often it is still a problem even when they allow pets – because of other guests who feel distracted by your dog. We try to minimize the disturbance to other guests as much as we can. Luckily, Loki doesn’t bark, but one of our rooms had a yappy dog next door who wouldn’t quit! !